The defeat of the French Bugattis in the 1934 French GP, at the hands of the Italians and Germans, started an uproar in France that made waves all the way up to the top politicians. The French state had already set up a national racing factory, the "Société d'Etude et de Fabrication d'Automobiles de Course" or SEFAC in short, and ordered it to build a GP winner for the 750kg formula. Looking back it would certainly have been wiser for the government to follow the German idea of supporting the existing manufacturers instead. To arrange the financial part a committee was founded, the "Comité de la Souscription Nationale pour le Fonds de Course". It is said that a camel is a horse planned by a committee and a camel the SEFAC would turn out to be. The committee started off by selling lapel badges for the public and begging the industry for help. While the excitement was high among all, the financial response proved to be a disappointment. For designing the car one of France's top designers was selected, Emile Petit, who had designed the Salmson voiturettes in the late 20s. Petit had a ridiculously small budget to work with but he tried his best. For the chassis he used a traditional design. The front suspension consisted of forward facing links and coil springs. In the rear the car had a live axle with coil springs. Transmission consisted of a Cotal electromagnetic gearbox. The 2771cc 8-cylinder engine was of an interesting design. It consisted of 2 four-cylinder blocks side by side, each with its own crankshaft on a common crankcase running in opposite directions. The units had double overhead cams and a single huge supercharger for both blocks. However it only produced 250bhp, the lowest value for any car in the 750kg class. The order price for a SEFAC, if someone had wanted one, had been set to 225 000 francs. In 1935 the French Automobile Club (ACF) decided to leave Grand Prix racing and turn to sports car racing instead. The 1935 French GP however had to be run to the 750kg formula, the invitations had already gone out and anyway a cancellation even before the SEFAC had had a chance to run was to show defeat to the Germans. The work on the car had been painfully slow but pressure was set upon Petit to have it ready for the 1935 French GP. The car arrived at Montlhéry for practice, only to be found well over the 750kg limit with 931kg on the scales. Marcel Lehoux took the car out on the track and made a couple of slow laps. He found the car to be extremely ill-prepared. The engine was short of power, the brakes did not work properly and the road holding was miserable. After Lehoux returned to the pits to explain the situation the car was pushed away and the entry was scratched. The team left Montlhéry in disgrace, leaving Benoist in the Bugatti as the sole entry to defend the French colors at their home GP. He raced a standard T59 in practice while the 4.9-litre T59/50 car used in the race appeared at midnight and was moved with the organizers' collusion without scrutineering into the Bugatti pit. It has been estimated that the Bugatti with such an engine must have weighed well over 800kg. The only problem was that a special bonnet had to be built in a hurry to make room for the larger engine. During the race the new bonnet fell off after only 4 laps making the French effort at Montlhéry a complete disaster. How could this effort have turned out so bad? The French public was soon to find out when the "Fonds de Course" gave their first report. In the first year the committee had collected over 676 000 francs. The bureaucrats had immediately swallowed 125 000 francs themselves and Bugatti and Delage had managed to get grips of 100 000 each. The SEFAC project itself had received a miserably 50 000 francs to build the GP winner with. That announcement created a new uproar and when the press and public finally calmed down SEFAC had suddenly become an orphan that no-one wanted to see or hear about anymore. The engine was rebuilt to 2960cc and the car was entered for some races but never appeared. Now the "Fonds de Course" made radical changes. The French yearly driving license fee was risen and 5 francs from each license went straight to the fund where the members would be sitting in committees discussing how to spend the 1 250 000 francs thus gained each year. For that new laws had to be approved, new forms had to be planned and printed. The car manufacturers realized the sad facts. The money had now been trapped in bureaucracy with no chance of any support for new GP cars in a foreseeable future. Finally in 1937 the committee announced that 1 million francs should go to the French car built to the 1938 formula that could run 200km at a speed exceeding 146.5km/h by the widest margin on the Montlhéry track before 1 September 1937. By lucky chance the SEFAC happened to fit into the new 1938 3-litre Grand Prix formula so there were rumors that the SEFAC should take up that challenge with Chaboud/Trémoulet as drivers on 27 August but the car never appeared. Dreyfus finally won the million for Delahaye. In 1938 a huge fight over the "Fonds de Course" money broke out. The Fund wanted to use a "winner takes all" system with French constructors competing each other with new cars, but the constructors had answered that it was impossible for them to start building GP winners without huge financial guarantees. A loss of the fund money would be a catastrophe for any loser so another system had to be thought of. After winning both the 1938 Pau and Cork GPs with their old sports cars, Delahaye was confident that they should get money to develop their new almost finished Type 155 GP car. To the horror of the Ecurie Bleue team 600 000 francs went instead to the Talbot factory when Anthony Lago showed a couple of blueprints and a promise of a new car for the French GP. Ecurie Bleue owner Lucy Schell threatened to boycott the French GP. ACF answered by declaring that only manufacturers that started in the French GP could expect further financial support. The other French manufacturers, Bugatti, Talbot and also the SEFAC, showed up for the GP but after a long fight with the ACF and a considerable amount of ill-feeling Lucy Schell moved her team headquarters to Monaco and no Delahayes were present at Reims. The SEFAC had already been out of time when it first appeared 3 years earlier and no major changes had been made. But Chaboud took the car to the start and managed to complete two laps before retiring. The SEFAC turned up once more before the war. It was at the 1939 Pau Grand Prix and it was raced by Trémoulet. Jean Trémoulet started off as racing mechanic to Delahaye driver Eugenè Chaboud. For the 1937 Le Mans he was entered as Chaboud's co-driver. That race turned out to be a short and dramatic one for him. On the lap 9 seven cars were coming into Maison Blanche in a bunch. In the first car, a Bugatti, Kippeurt lost control and crashed. The car rolled over and the driver was thrown out into the middle of the road. Roth in a BMW went off the road to the right into the hedge to avoid the wreckage but Fairfield in another BMW crashed into the Bugatti at full speed. Then Trémoulet's Delahaye hit the BMW, sending it end over end 100 meters into the fields. In the next seconds the Talbot of "Raph" crashed into the Delahaye and Forestier's Riley into the Talbot. Then it was over. Kippeurt was dead, Fairfield dying and "Raph" seriously wounded. Roth had lost his front teeths and was unconscious while Trémoulet had lost a lobe in his right ear and was in deep shock. Only Forestier was in a shape good enough to run up the track to warn the rest of the competitors. One could understand that such an experience would have refrained Trémoulet from further racing but in fact he continued as Chaboud's co-driver and the results started to come. They were 6th at the French and Marne GPs that year and the next year Trémoulet was 4th at Chimay. And then they returned to Le Mans and after a steady drive the highlight of their careers came as Sommer's leading Alfa suddenly retired and the Delahaye drivers could take the flag as winners of the 1938 Le Mans. Then Trémoulet left the partnership with Chaboud. He raced a new 12-cylinder Delage at the Paris 12h race and the 1939 Antwerp GP, a Talbot at Le Mans and at Comminges and an Amilcar at Péronne. And in between, as already said, he had the dubious honour of racing the SEFAC at Pau. Except for the SEFAC the entry included three Mercedes cars for Caracciola, von Brauchitsch and Lang. Auto Union wasn't starting as Nuvolari was their head driver and the Italians were boycotting the French races. A works Alfa Romeo was entered under Sommer's name to avoid any problems with Mussolini. The rest of the field consisted of de Graffenried's Maserati and a bunch of French Delahayes, Bugattis and Talbots. To avoid a repetition of the 1938 race, Mercedes had sent three of their new cars with tanks large enough to make the race non-stop. Not unexpectedly the team dominated practice. Von Brauchitsch was fastest during first day with a time of 1:46 against Caracciola with 1:48 and Lang with 1:51. On the second day Mercedes' reserve Seaman was actually fastest with 1:46 and Lang was able to better his time to 1:47. During practice the SEFAC showed that its handling had not improved as it spun, filling the track with gravel. In spite of the rainy weather a big crowd turned out for the race. When the flag dropped Caracciola took the lead followed by von Brauchitsch, Lang, Sommer, Carrière and Étancelin. Both de Graffenried and Trintignant were soon out with technical problems. Their fate was soon shared by Chaboud and Balsa. By 15 laps the Mercedes trio had half a minute lead over Carriére and team manager Neubauer gave orders to the drivers to ease the pace. Sommer retook fourth place from Carriére. At 31 laps an oil pipe broke on both Caracciola's and Carriére's cars. The former retired in the pit while the Talbot driver lost control in the smoke from the engine and crashed. Von Brauchitsch was now leading followed by Lang, Sommer, Étancelin and Mazaud. By half distance the two Mercedes cars had lapped the entire field. At lap 82 the engine on von Brauchitsch's Mercedes, which was leading by half a minute, cut out in the chicane. Von Brauchitsch believed that he was out of fuel and made a surprise pit stop, leaving over the lead to his teammate. Sommer also came in for fuel but the Alfa Romeo refused to restart and Sommer lost 8 minutes in the pits and his third place to Étancelin's Talbot before he could rejoin the race. Despite von Brauchitsch's efforts to close the gap to the leader by making the fastest laps of the race, Lang controlled the last laps to take the flag as the winner of the Pau GP. Étancelin's Talbot was third and Sommer's Alfa fourth followed far back by some Delahaye sportscars. After the race a furious von Brauchitsch discovered that the car had not run out of fuel at all, but that it had been a pick-up problem, so that he had lost the race because of an unnecessary stop. In the race Trémoulet had managed to complete 35 laps before the car ran out of fuel, making it into another sad day for SEFAC and the end of its pre-war appearances. Trémoulet joined the French resistance during the war and died in 1942 in an motorcycle accident. Then in 1948 to the amazement of all the SEFAC appeared once again. A company called Dommartin started to rebuild the car. They gave it a new body, bored out the engine to 3.6 litre and removed the supercharger. Then the money ran out and SEFAC once more returned to the shadows. And the story isn't over yet. The SEFAC is now in the hands of car restorer Richard Line and with some luck in the years to come SEFAC will once more take to the track, finally to be met with awe instead of ridicule. For 1934 the French tried to find a new challenger for the 750 kg Grand Prix formula. It was supposed to be a French national racing car, financed by the public. A national fund (F.N.C.A.F.) had been initiated but was not well enough supported. A desperate attempt was made not to funnel the money to the most experienced French constructor of racing cars, Ettore Bugatti in Molsheim. The result of this effort was the founding of the Société d'Étude et de Fabrication d'Automobiles de Courses or SEFAC. The car began its hopeless existence when former Salmson racing car designer Émile Petit was hired to design the car, which had a 2770cc engine. Two 4-cylinder blocks were mounted side by side with crankshafts rotating in opposite directions in a common crankcase. It had twin-ohc and semi-desmodromic valve gear with two Solex carburetors and supercharger. The 250hp were transmitted through a Coatal electromagnetic 4-speed gearbox. All four wheels had independent suspension. The SEFAC was a French fiasco. If the car did not appear for practice, it broke down during practice. It was a special occasion, when the car made the grid on race day. The SEFAC never ever finished a race. It had been entered for the 1934 French Grand Prix with R. Sommer as driver but the car never turned up. After its failure to appear at the 1935 Monaco, Tunis and Tripoli GP, the first start of the SEFAC was in the French Grand Pix at Montlhéry when Marcel Lehoux tried in vain to bring the car to the start. He did a few practice laps but since the car was overweight and uncompetitive it was decided not to start in the race. During 1936 and 1937 France decided to hold their races for sportscars only and therefore the SEFAC never raced in the 750kg formula, for which it was designed. Since the car had an engine sized below three litres, the old original car was allowed to start in 1938 with the new formula in place. It now appeared in the 1938 French Grand Prix at Reims with a streamlined nose. But the SEFAC lasted just over two laps, with Eugène Chaboud driving. At the weighing in, the SEFAC brought 931kg to the scale, almost sufficient proof that the car had been overweight in 1935. Surprisingly the SEFAC surfaced again in 1948. It was entered for that year's French GP at Reims, but was now renamed as Dommartin, after the engine company, with Yves Giraud-Cabantous as driver. Emile Petit was still the responsible designer but the car was unrecognizable as a SEFAC since it was totally re-bodied and now with its supercharger removed and the engine enlarged to 3.6 litre. But the car did not race. The SEFAC under the Dommartin name rests now in the Musée de Chatellerault. 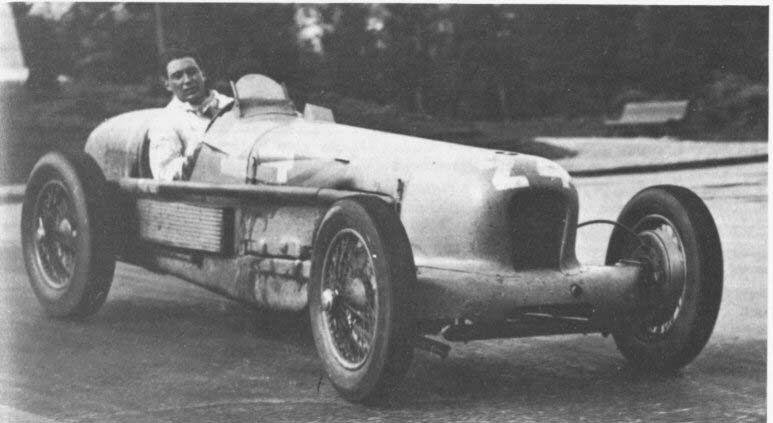 The last race appearance of the SEFAC, with Jean Trémoulet behind the wheel, took place at the season opener on 2 April 1939 in southern France at le Grand Prix de Pau. There were only 15 cars at the start and over 20 could have been there but Auto Union and the Italian Alfa Romeo and Maserati teams were not present. Politics had interfered. Because the French government supported the Spanish Royalists fighting Fascism, Benito Mussolini, a Fascist himself, banned all Italian drivers from racing in France. Since Nuvolari, was Auto Union's number one driver and of Italian nationality, the Germans refused to race in Pau. Jean Trémoulet in the SEFAC had a slight accident in Saturday practice when he spun and covered the track with gravel. The car was repaired in time to do battle on Sunday. Trémoulet, new in Grand Prix racing, had driven in several French sportscar races and with Eugène Chaboud had shared a Delahaye in 1938, winning the 24 Hours of Le Mans. There was a large crowd and all seats were taken in the grand stands. The light rain showers during the morning had been replaced with sunshine at the time of the start at 1:30 PM. The three Silver Arrows, which had been fastest in practice, occupied the front row. The 15 cars took off for the 276.900 km race over the twisty 2.769 km city circuit with Caracciola in the lead followed by von Brauchitsch, Lang, Sommer, Carrière and Étancelin. Caracciola tried to pull away for an early advantage but Brauchitsch followed him closely and did not let him get away. But Caratsch established the fastest lap of 1m47s on his second tour. Both de Graffenried and Trintignant were out with technical problems early on and were followed by Chaboud and Balsa. After 20 laps, the German cars had lapped the entire opposition. On lap 27, Caracciola came into the pits with a broken oil pipe. After a stop of 11 minutes and a provisional repair, he joined the race again but after 1.5 kilometer he stopped for good. Manfred von Brauchitsch had now inherited the lead and maintained his fast pace. Carrière in his new Talbot hit the curb at a sidewalk, bent his front axle and became a spectator. The Swiss de Graffenried and two Delahayes retired and by mid-race half the cars were gone. Von Brauchitsch was leading Lang by half a minute and looked like the sure winner. The new Continental tires did not need to be changed during the race and Daimler-Benz had increased the size of the fuel tank, enabling the new Mercedes-Benz Grand Prix car to do the 100 laps of Pau without fuel stop. This was to avoid a repeat of their fiasco at last year's race. Lang tried to catch von Brauchitsch over the next laps till lap 81. Then Brauchitsch pulled in his pits after his engine had sputtered at a hairpin bend. While the mechanics attended to his car putting fuel in the tank, Lang screamed past the pits to take the lead. After Brauchitsch had joined the race again, he chased after Lang to catch him but his attempts were in vain since Lang was signaled of his team mate's progress. Brauchitsch came closer and equalled Caracciola's fastest lap of 1m47s on lap 84. Finally, Lang began to increase his pace. During that time he did several fast laps, equalling also the 1m47s lap record of Caracciola and von Brauchitsch, not just once but three times; on lap 85, 87 and 88. Due to a lengthy pit stop near the end of the race, Sommer had lost his third place to Étancelin. Sommer had serious trouble getting his car started and even leaving the pits without the hood did not help him catching the experienced Etancelin. Lang finished after 3h07m25s, followed 17 seconds later by von Brauchitsch. Etancelin in the new 4.5-litre Talbot Monoplace Decalée was two laps behind and Sommer's private Alfa Romeo 308 in fourth place was five laps behind. Then followed the Frenchmen J. Paul, Mazaud, Biolay and Contet, all in last year's 4.5-litre Delahayes. After the race, von Brauchitsch was upset because he had misread the sputtering of his engine being caused by an empty fuel tank and pulled into the pits to ask for fuel. His car was then checked and found to have sufficient fuel to finish the race without stopping at the pits for fuel. Unbelievably, at its last appearance, the SEFAC with Jean Trémoulet as driver, in actual fact had completed 35 laps before its retirement.